There is only one place to start today, the sudden passing yesterday of Ipswich enthusiast James Long, known as Jim. I didn't know Jim that well, but we met a couple of times at Ipswich depot and got on like a house on fire. Jim was always happy to share information and pictures, and was a slave to detail. Ipswich will be empty without him, not only for his knowledge and enormous picture archive, but from all accounts for the man he was. Our thoughts are with Jim's wife, Eve and his family right now, and I urge you all to read long time friend Grahame Bessey's tribute to Jim on East Norfolk Bus Blog by clicking here. I have good news for people living between Bungay and Great Yarmouth. I think. Maybe - it's all a bit confusing right now so here goes. Having won the new tender to operate the 80/81 between Diss and Yarmouth it appears Anglian found something amiss and handed the tender back. So Simonds were awarded the tender, which was to be operated in conjunction with Borderbus. Ok so far? Now since then there have been further developments. 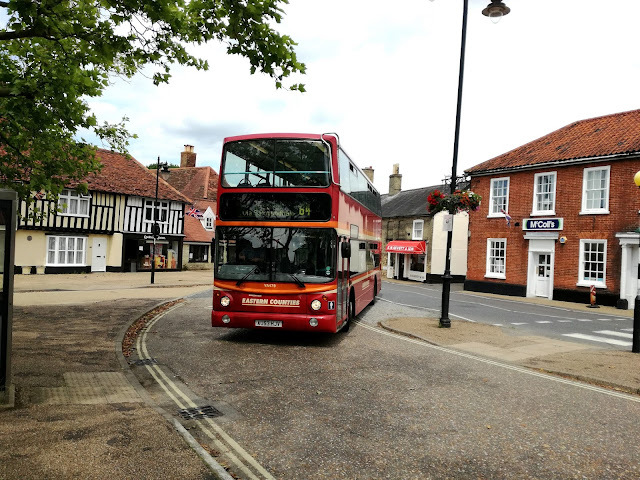 Anglian have let it be known they are going to be operating the 81 between Bungay and Yarmouth on a commercial basis - I have even seen the proposed timetable - however have yet to register it on VOSA. This has not impressed Borderbus who yesterday registered the 580 between Bungay and Yarmouth, again on a commercial basis, to commence on August the 15th. 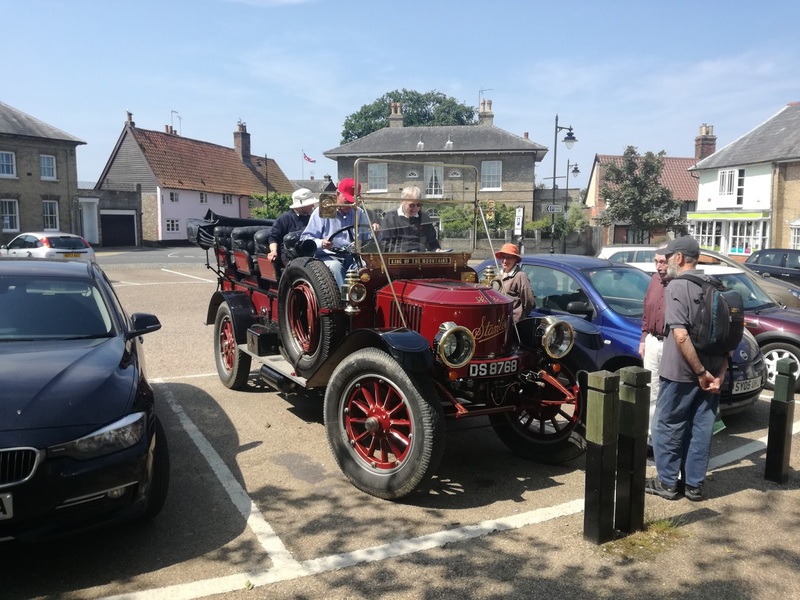 In the meantime Norfolk CC have once again issued a tender for the route as the smaller villages still have to be served. I'm told all will be resolved in the next couple of weeks but it's certainly not dull right now! Now for the latest on Ipswich Park & Ride. 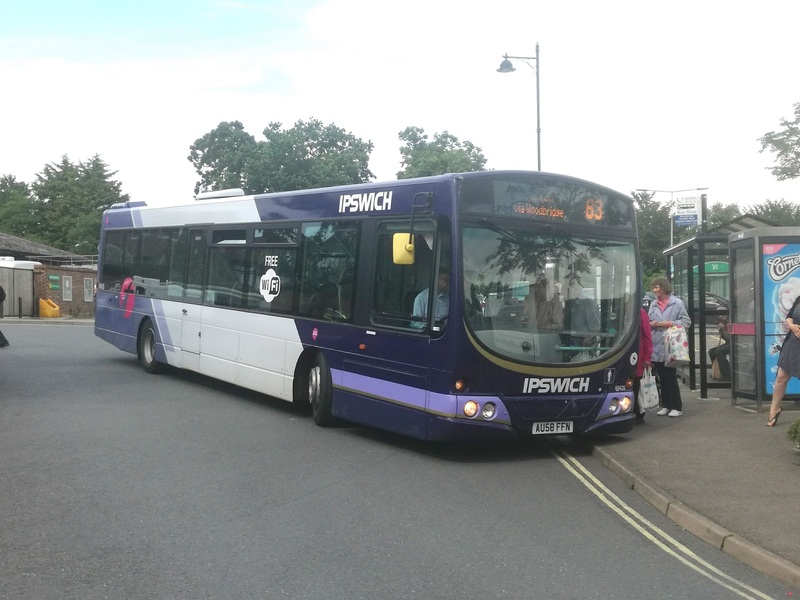 Ipswich Buses seem determined to mix the residents of Chantry and P&R passengers from Copdock together on the 13, running 9 buses an hour that won't bunch at all of course. Madness is all I have to say. As for Martlesham I am led to understand the current idea is that the 66 won't touch the P&R site as first thought. 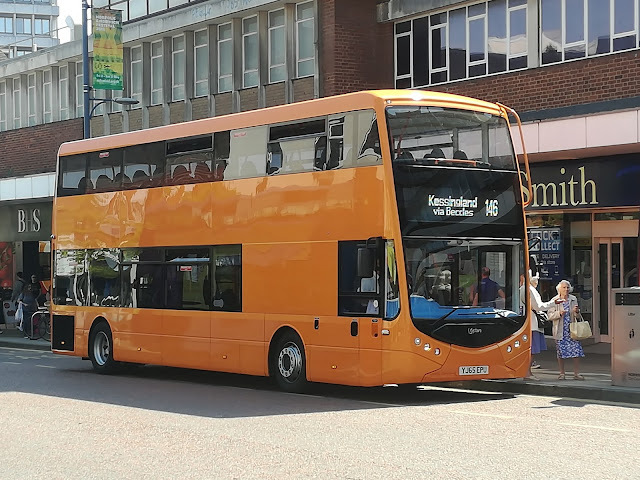 Instead the 63/4/5 will serve the site every haf hour, with a "short" service running in between to give a basic 15 min service in the same way Konect are changing Postwick P&R in Norwich to accommodate the 7. Of course by time next January comes all this will have changed again but it's always interesting to see how things develop. I had a pleasant surprise yesterday en route to Woodbridge. For the first time I saw VA479 on an Ipswich route that wasn't the 66. Wickham market was the place and by luck I had to catch it to Woodbridge so got a couple of decent photo opportunities. It then became rather a who's who of the Ipswich fleet, as both the excel fronted B7rle's, 69426/8 appeared in quick succession. These fronts still look the business, and whoever came up with the idea should be congratulated, shouldn't we Sam! And then to cap it all a very smart Van Hool tri-axle coach unloaded a lot of tourists to amle the delights Woodbridge has to offer. 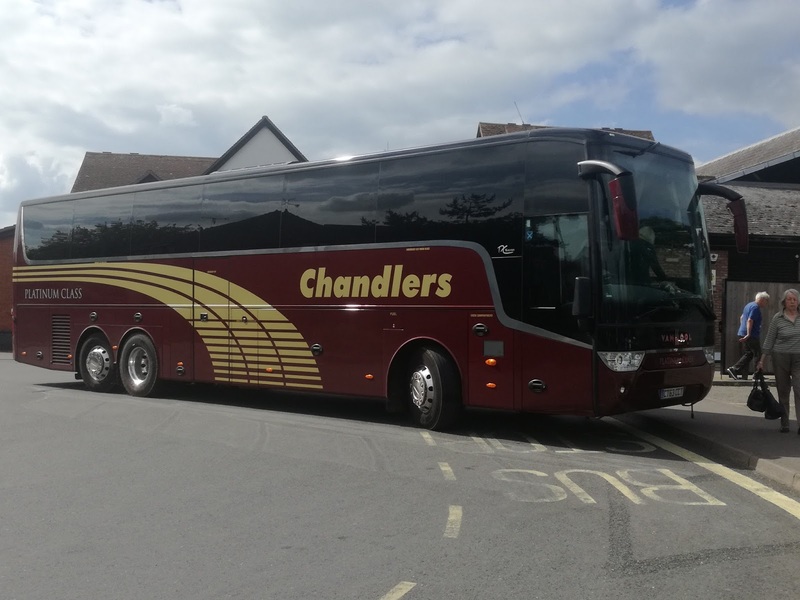 CT63 CCT was new to Chandlers Coaches of Westbury, Wiltshire in 2013. As I expected getting bookings on Suffolk County Council's much vaunted Connecting Communities is a bit of a joke. No one seems to know where their buses go and when. One operator has even stopped accepting Concessionary Passes using a vehicle size loophole, and SCC have apparently approved this. The Government giveth and the Council taketh away. This is typical of how it hss been so far. On Friday I have to get to Lowestoft on what is certainly not a pleasure visit. So not being able to get to Wangford anymore to pick up a bus to Lowestoft I rang up and tried to book to Halesworth. Sorry that's in the restricted zone - we can't take you there. Area 51 I presume. You'll have to go to Darsham and get a train. Ookay so be it, but I was confused as the drivers had told me they were going to Halesworth. So I rang again yesterday to double check. Yes, Halesworth is in the restricted zone. I am aware of that but is it all day Fridays? Oh no you're right we can take you there. Finally! 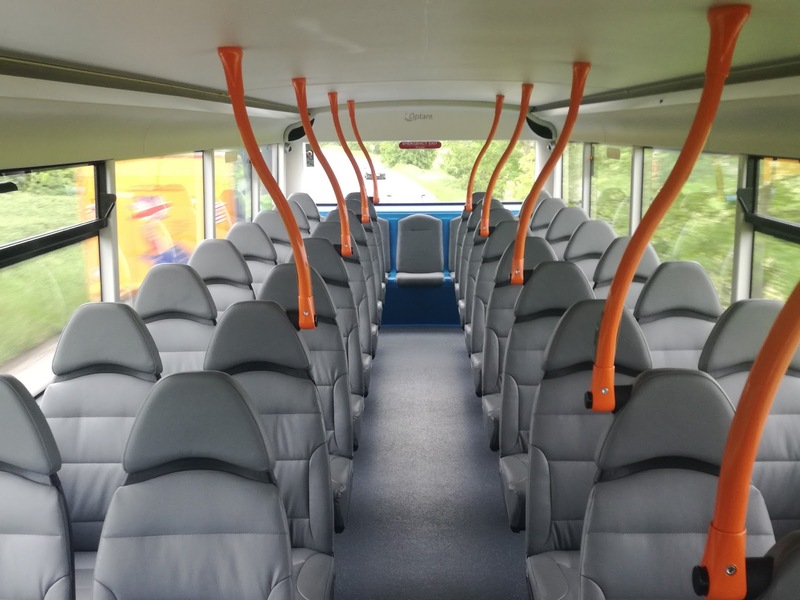 So then I thought I'd really push my luck and book the new Pathfinder bus, operated by Beccles and Bungay Community Transport. "Hi, can you get me from Halesworth to Wrentham please?". "Sorry we only go there on Mondays........" In the name of all that's holy can we have the 62 back please! 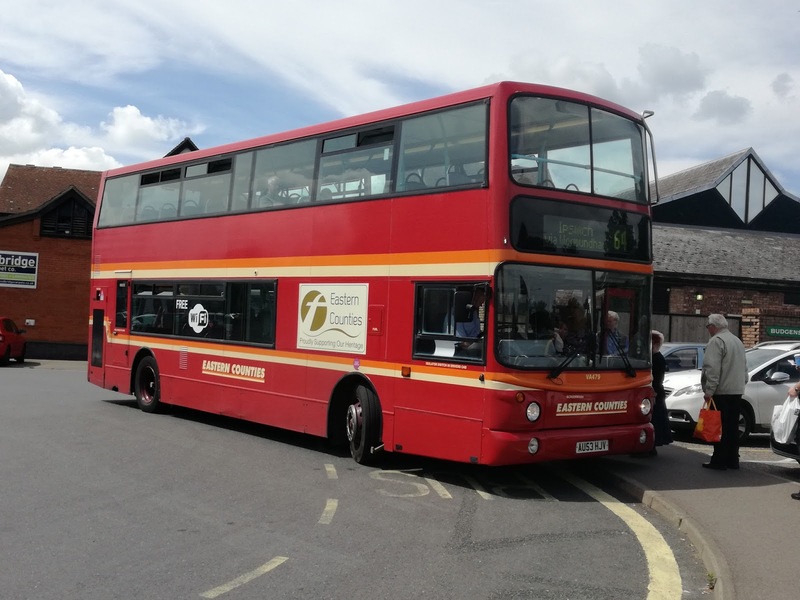 And speaking of the 62, part of the route was replaced by the 60H, and Anglian have released the latest well thought out timetable for that route starting in late July. Did I say well thought out, sorry I didn't mean that. I meant another timetable designed to drive people off the route so it can be scrapped once and for all - do they think we are stupid? I had one of my regular trips to West Sussex the other day, to the eye hospital. For me the travelling is all part of the day, and I always look forward to it, although there is always the knowledge that everything can go belly up in a split second. And so it proved. A good journey down, a productive hour taking videos at East Croydon, including completely missing an approaching new Thameslink Class 700 as I was focused on a 377 on an adjacent platform - most embarrassing - and a productive hospital appointment. In fact too productive as I was in with the consultant for ages discussing possible new avenues to explore, and that made getting back to London in time for my train back to Suffolk a bit of a rush. However I made it to Liverpool St for the 2000 with around 15 mins to spare. Searched for the platform on the departure board, only to see it displaying that most dreaded of all platforms - platform cancelled. Deep joy - apart from anything else I would have to let the person picking me up from Darsham know that I would be late, but no real worries. Until I couldn't get hold of her. Never mind I'll keep trying - let's make sure the 2100 is running as I'd rather wait the extra time in London than on Ipswich Station. So having checked the midweek engineering work posters and seeing the 2100 terminated at Ipswich I tweeted Greater Anglia and asked them if the 2100 was running, only to be told that the 2100 was terminating at Colchester and I'd have to change. That would mean missing the last connection up the East Suffolk Line so another swift change of plan and I caught the 2030 out of Liverpool St and that's where the real fun began. We got as far as the Olympic Stadium when we stopped. And waited. Now people take the mickey out of us enthusiasts but there are times being one comes in very useful. Being a supporter of Railcam I get access to live running diagrams, so I quickly pulled up the Stratford diagram to discover we were stuck behind an empty train, which had stopped for no apparent reason as the line was totally clear in front of it. Cue the Conductor on the PA: "I'm sorry for the delay to this service tonight, which is being caused by congestion in the Stratford area". Excuse me? At the very point he made that announcement there was not a single train in Stratford Station, and in front of the empty train our line was clear to Ilford. Anyhow the empty train decided it had had sufficient rest and off it went, us following in its wake and that was the end of the excitement. Until we got to just outside Maningtree where we stopped again at a signal instinct told me we shouldn't really be stopping at unless there were problems ahead. I pulled the diagram up again and sure enough a freight train was in front of us going nowhere fast. According to its schedule it had been there for around 20 mins. I told the people around me what I had seen and as I told them the PA crackled into life again confirming that indeed the freight train in front of us had failed, not just failed but had run out of diesel. Those locos have 1,400 gallon tanks. It had run out. We were stuck behind it. So we were told a rescue loco (known in the railway world as a "thunderbird") would be sent from Ipswich and drag the freight train out of the way.. No time scale was estimated. Thanks to my Railcam diagrams I was able to see when the thunderbird left Ipswich, and follow its progress to the failed train. In the meantime the poor Conductor kept making announcements saying that they didn't know how long this was all going to take and in the meantime we would reverse back to Colchester. We started reversing as the thunderbird was within half a mile of the train it was rescuing. I was able to keep people in my coach updated far quicker than the conductor was. To cut a long story short the thunderbird did its job we got moving again, and I was treated to a taxi home from Ipswich, which Freightliner will end up paying for, arriving home some 2 hours later than planned. The person picking me up was contacted in the nick of time and stood down and all's well that ends well. However it got me thinking. I'm pretty sure I was the only person on that train, crew included, who knew exactly what was going on. At first I thought the Conductor was lying through his teeth about Stratford, but if that is what control told him what reason would he have not to believe them. Now you hear time and time again that one of the main complaints about rail travel is lack of information when things go wrong. I got really irate when we were told the 2000 was cancelled due to an "earlier incident". What incident? What happened? The day before we had been told extremely quickly in graphic detail of the tragic mass shooting in Orlando. Yesterday the news broadcasters couldn't wait to tell us how poor Jo Cox was murdered in broad daylight. Yet Greater Anglia think we aren't grown up enough to know when someone has been hit by a train. It's not industry standard by the way - both Virgin Trans and Great Western say what the incidents are and treat their customers as grown ups. I found when I was a Conductor that if you tell people exactly what's going on they will accept it. People get a lot more irate a lot quicker if they are kept in the dark or treated as if they aren't entitled to know. That's a poor policy. But the bigger question remains. If I could pull up on my phone wthin seconds the diagram of where we were and work out what was going on why couldn't the crew? Are we still in the days where the train crew have to call supervisors or signallers to find out what's going on? That's tortuous as for obvious reasons the very people you are trying to contact are busy trying to sort the situations out. I remember being berated by a passenger one evening when she complained I hadn't given any information out, when I was pacing up and down the platform on my phone trying to get the informatin she wanted to know. Of course then she compounded the situation by asking "Why haven't you made an announcement telling us you have no information" I very nearly turned into John Cleese as I explained that if I was making announcements saying I had no information I couldn't be on my phone trying to get information to announce! But surely the crew should have access to the same diagrams I do, so information can be quickly ascertained, or at least a rough idea so passengers can be kept informed. If I was Greater Anglia I would be a bit embarrassed to know a passenger knew what was going on before my crew did. Perhaps all train crew should have access to Railcam and the diagrams. It is something I will be researching further as anything that improves customer communication has got to be a step in the right direction. I met with the Metrodecker at picturesque Wangford, just off the A12 not far from Southwold. A gloriously sunny morning tested my new phone camera to the limits and I'm pleased to say it passed! As you will have seen from my first report I was impressed by the ride, and so settles into my usual front nearside seat upstairs and settled down for an expected enjoyable trip to Norwich. If you look through the top deck windscreen you will notice a rather wide pillar after the short front nearside window. I first thought this would be an issue as it was dead level with my shoulder, but no, if anything it was a bonus and I could have easily nodded off had I been so inclined. I also mentioned that acceleration was smooth, and not savage enough to throw people down the bus. This again was the case, and I found acceleration from bus stops pleasant and not unduly sluggish. However, that is all well and good for passenger comfort, but not necessarily good for timekeeping. 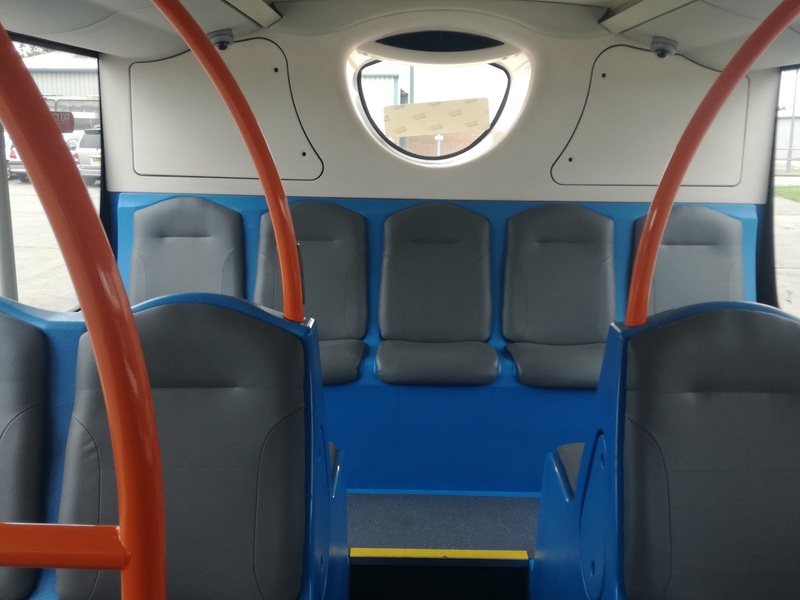 Because the Metrodecker lacks the extra poke when needed it means gaps you could take advantage for in other vehicles at roundabouts etc you can't on the |Metrodecker, and this is an issue I think Optare need to examine. With increasing amounts of traffic on the roads buses need to be more nippy off the mark when needed and the Metrodecker is certainly not that. It also lacks power going up hill. As we climbed out of Thurton on the A146, which lets face it is hardly a mountain, the Metrodecker lost power like an old Fleetline. I checked with the driver when we got to Norwich if he had had his foot to the floor and he confirmed he had. So the conclusion has to be the Metrodecker lacks torque, which is an issue with Euro 6 engines, but needs to be addressed. Apart from that I have no complaints whatsoever about the ride. No rattles, comfy sears with more than adequate leg room, smooth braking with no screaming retarders, and just as quiet at speed as at low speed. Sort the power out and there is a truly excellent vehicle in the making. I was racking my brains to think of a similar ride from the past, and I kept coming back to the old Olympian coaches. Yes the ride was that good. However a chat with the driver at Norwich revealed issues a passenger wouldn't necessarily notice. Take another look at the pic above. I was delighted to see the pillars at the front were nothing like the width of the Streetdeck. However they are actually wider at the bottom than the top and this has an impact on driver's vision. The driver said he had never driven a bus with so many blind spots, and even with a side camera which with so many cyclists around now has to be a good thing, there is a panel behind the doors which makes pulling out at an angle very difficult. Looking through my pics I haven't got one that shows it perfectly, but this one gives the general idea. Imagine you are the driver having to look behind the doors for approaching traffic. The driver also mentioned the dash and steering column were not able to be adjusted, and this is also something Optare need to look into. One thing I mentioned, and indeed compared were the stairs. I felt a difference immediately I climbed them and measured them against one of the Presidents at Borderbus. They are the standard 9 inches. 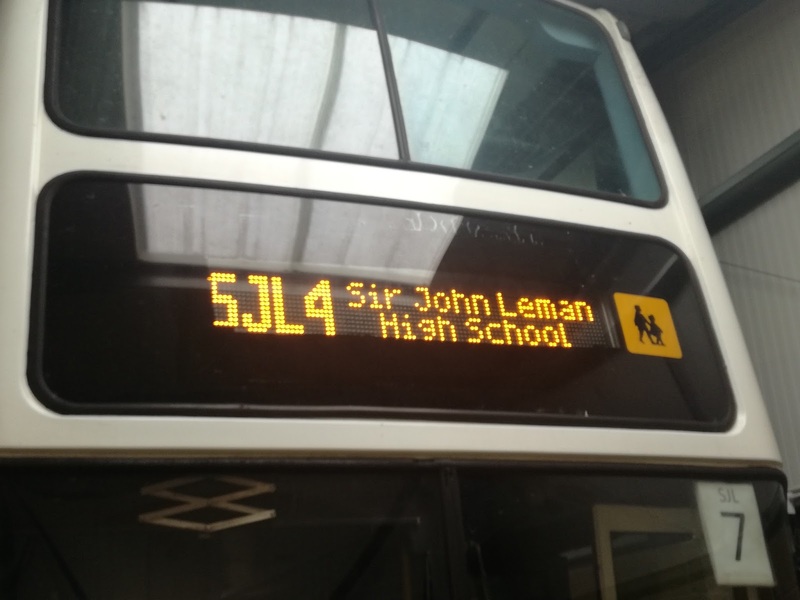 However the driver told me that one thing he had noticed was the school children had taken much longer to get down the stairs than they did on the Presidents, and some had commented that the stairs on the Metrodecker were steeper. If kids have more problems on these stairs then older, less supple passengers are going to have real troubles, which again will affect timekeeping. I was glad it wasn't just me though, as I made a big point about the stairs on the trial run we went on. Optare's parent company, Ashok Leyland have insisted that all issues are ironed out before the bus goes into mass production, which is why they are asking for feedback from operators (and I hope bloggers). I think this is an admirable way of doing things, and is certainly better than releasing a vehicle, making a quick buck then years later when everyone has had enough making 300 changes before you finally get a half decent vehicle. 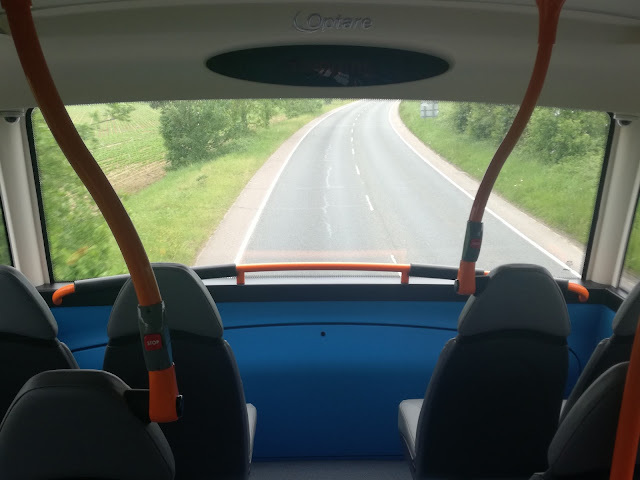 Yes the Metrodecker has some issues, but they shouldn't be too difficult to rectify, and we were unable to test for things such as interior light reflection in the windscreen due to the time of year, or how it performs in high winds being so light. 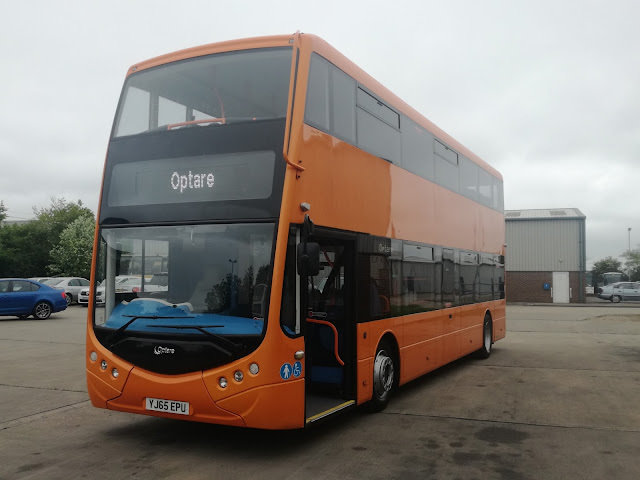 I confess in the past I haven't been Optare's greatest fan, but get these issues sorted out, and in my view the Metrodecker will be the best double decker available on the market. I got off at Norwich, took another pic that my old camera would have really complained about, and wondered when I would enjoy a ride on a new bus as much again. It has been confirmed to me that following the return of the tender for operation of the Diss - Beccles - Yarmouth 80/81 by Anglian Bus, from September the route has been awarded to Simonds, who will operate the route in conjunction with Borderbus. More details will follow in due course. Apparently Anglian are denying to their staff that they have returned the contract. After some comments that appeared on the blog earlier today, making insinuations of malpractice at Anglian in the period before its sale to Go-Ahead and personal remarks dorected at Andrew Pursey I feel it is important to clarify a few facts so individuals can decide if it's really worth carrying on this vendetta, which could lead to some potentially damaging legal situations if not stopped. When Anglian was sold to Go-Ahead, after the compulsory due diligence procedures had been satisfactorily completed, the company was not owned by Andrew Pursey but his parents. They had built the company up over many years and had reached the time to retire, indeed Mr Pursey Snr was in ill health and sadly did not live long enough to enjoy the fruits of his labours. Andrew Pursey stayed on as operations manager but did not enjoy working for a big company and decided to leave, forming Borderbus from scratch in the time to come. Andrew's parents sold Anglian to give their family financial security for generations to come - and I defy anyone to say they wouldn't do the same given the opportunity. So I would advise those people making false accusations and insinuations against Andrew Pursey and his family to think very carefully before carrying on with it. 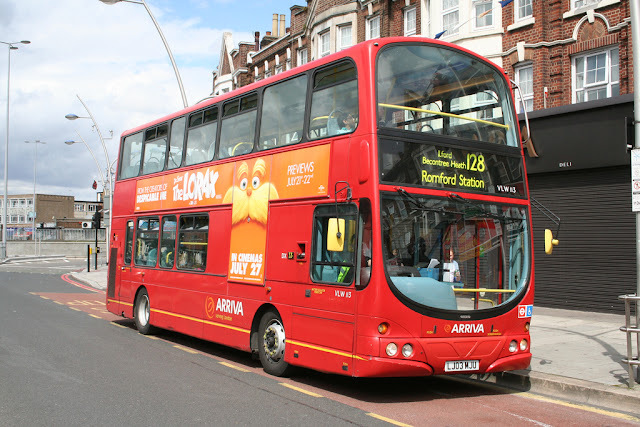 Andrew Pursey has never owned Anglian Buses. I would also add that I have not written this on the request of Andrew Pursey, indeed I have not been in touch with him since the comments were posted. There have been rumours circulating for well over a year now that Anglian Bus were in trouble. 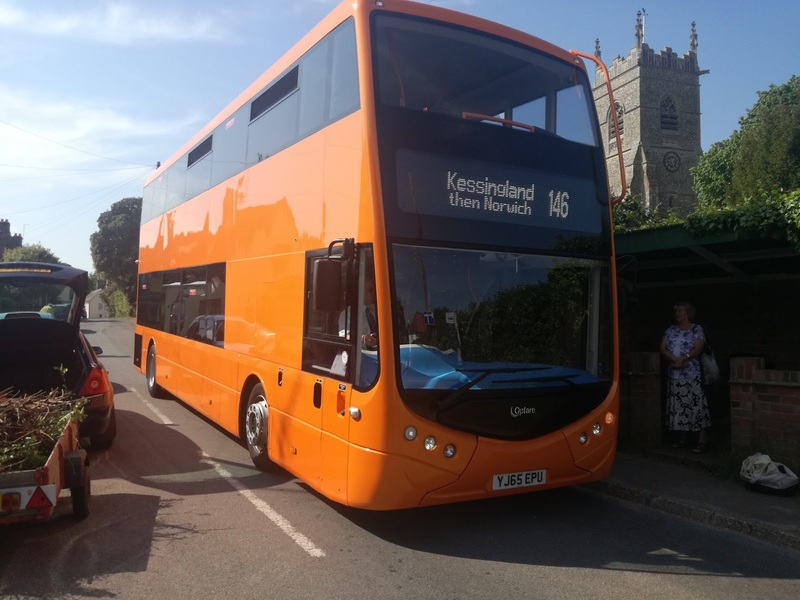 routes have been cut, tenders taken away, more routes cut, and last week the announcement that the 61 was being withdrawn between Kessingland and Southwold, and the 7 absorbed into the Norwich Park & Ride network. However one of the silver linings around that cloud was the revelation that Anglian had retained, to everyone's surprise, the tender for the 80/81 between Yarmouth - Beccles - Diss. Was that a sign that the cancer that has been destroying Anglian for the last three years had finally been cut back to the bone and new healthy flesh was starting to grow? Had the corner that needed turning finally been located? I received information today that Anglian have told Norfolk County Council that they no longer want the 80/81 tender, and have returned the route. As such, the next preferred bidder, Simonds will be operating the route from September. Full details have to be ascertained - as soon as I know I'll let you know. Obviously this raises a humongous question mark over the future of Anglian. Firms with a future do not hand back tenders. I only hope something can be done, but with Go-Ahead already shutting the lovely Tollesbury depot in Essex and cancelling all routes in the area, I can't see them throwing anymore money at Anglian. I'm not writing obituaries yet, but if they do have to be written it will make uncomfortable reading for some. 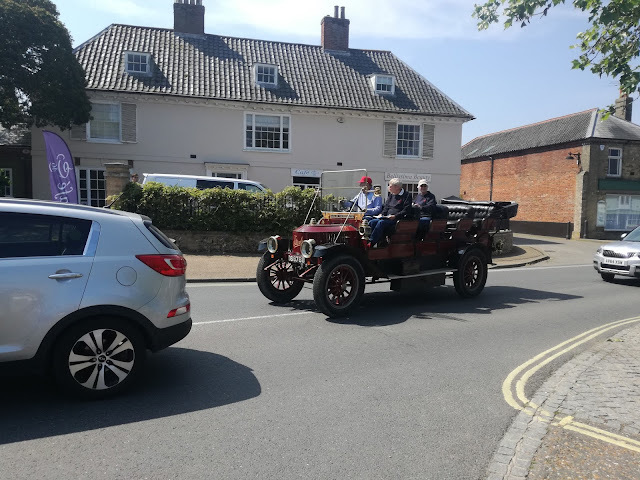 And speaking of uncomfortable reading my predictions about the future of Demand Responsive Transport in Suffolk are coming true. I attempted to book the new all singing all dancing all "good news" Connecting Communities service today for NEXT Wednesday, to take me to Saxmunsham, to connect with the 64, which is the whole purpose of the Connecting Communities initiative. Sorry we have nothing before 3.30, I was told, which since my appointment in Woodbridge is 11:20 isn't much use. Other areas still haven't worked out their routes or even if they are going to accept Concessionary Passes. One driver told me today the new bus he's meant to be driving next week hasn't been delivered yet so what he'll have to drive with the wrong sign writing is anyone's guess. The blame lies firmly and squarely with Suffolk County Council. At no time were passengers consulted, or if they were it was clearly ignored. 3 busy areas have been merged into two areas and many people affected by not being served by areas in the future. The organisation has been farcical, and is yet another nail in the coffin of rural transport. As a result I am now stuck in my village for the next 5 days, unable to get out. Way to go SCC. Someone commented yesterday that what SCC knew about transport you could put on a fleas behind. Somehow I think that might be vastly too much space. 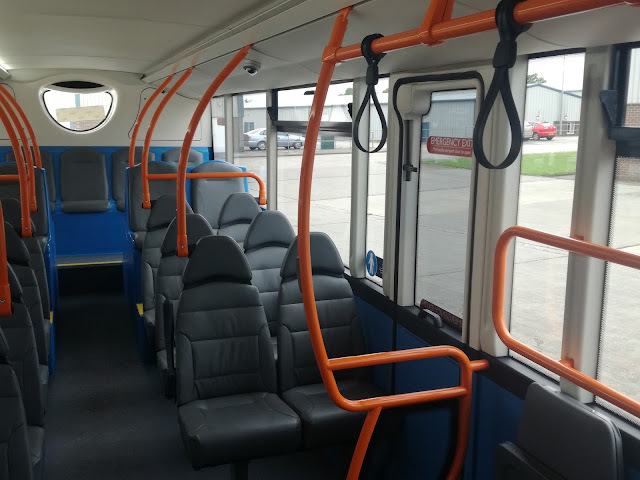 Finally I travelled in service on the Optare Metrodecker today, I'll do a full post on my findings in a day or so, but this news rather superceded it. There are some things you just don't expect - Leicester City winning the Premiership, a train running on time, Anglian to expand services, you know the sort of thing. 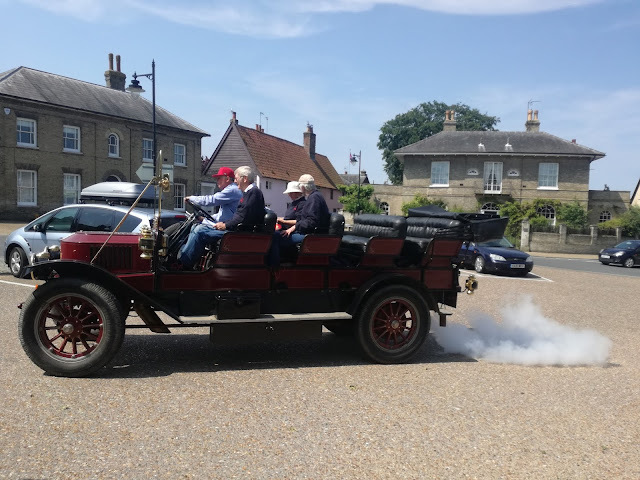 When I left home today I didn't expect to see a steam bus, but that is precisely what I saw in Wickham Market. Allow me to introduce you to the Stanley Model 812 Mountain Wagon "King of the Mountains", designed to take visitors the 34 miles uphill from the railway station in Loveland, Colorado, into Estes Park, in the heart of the Colorado Rockies, where the Stanley hotel remains to this day. This particular vehicle was built in 1914, would have cost around £300 new, and has amazing pulling power, far more than any internal combustion engined car of the time. It will do 60mph, and pulling away sounds identical to a steam train. There are 8 seats including the driver, although 3 children could easily fit in a row. It's amazing to think that old girl, or boy if it's a King, is over 100 years old, produces little harmful emissions (gets through 90 gallons of water every 50 miles though) and yet it is still a struggle to build engines with low emissions - isn't it VW! I got my information on the Steam Wagon, which is on a tour of East Anglia, from a very informative article at steamcar.net. I urge you to read the full article, which you can by clicking here. Still thinks it's in US driving on the right! Moving on if you cast your minds to February I exclusively broke the news that Ipswich Park & Ride was set to close.This led to panic by the council who denied it. I also suggested, together with regular commentator Smurf, that the car parks would be kept open but service buses would take over from the dedicated service. It'll never happen a lot of people said. Well according to the Ipswich Star last night it most definitely IS happening, with Copdock P&R being absorbed into Ipswich Buses' 13, and Martlesham into First Ipswich's 66. It is suggested the 13 will be increased from 5 buses an hour to 9. 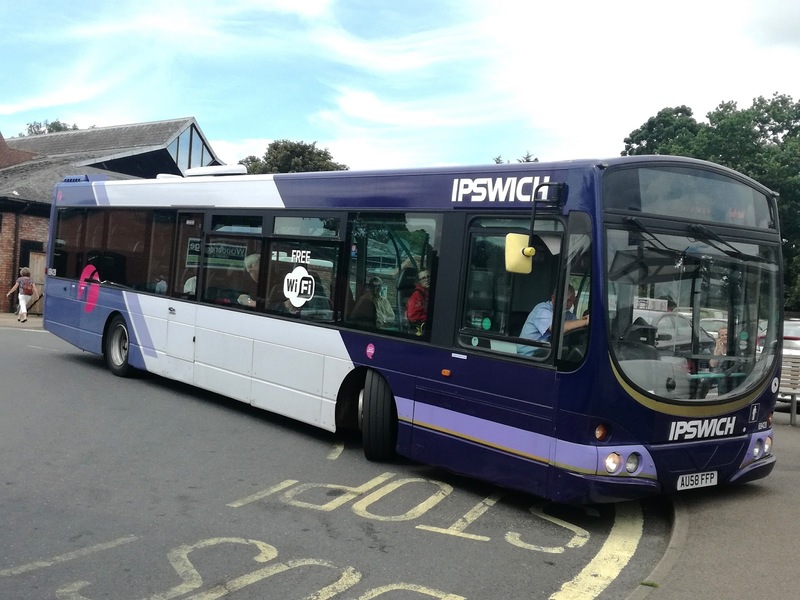 The details for the 66 are yet to be finalised..
Now guys listen to me - there is an obvious solution to this which will benefit everyone, and I'm talking mainly to Ipswich Buses here as First know my ideas on this. Run the 13 as a circular service so after Chantry and Tesco it runs direct back to the town via the current P&R route, thus maintaining the direct link. Passengers from Tesco will like this too. The 13A can run the opposite way round to bring people back from town then it can return back via Chantry. That way you will also avoid having P&R loads and Chantry loads on the same bus. 5 buses an hour now often bunch - what will 9 do? Common sense. The same can be applied to the 66, although I think the Martlesham terminus may well see more than the 66 in there - we will see on that one. My thanks to Brain and Andrew for alerting me to the Ipswich Star article, which you can read in full here. Rather good to be right over three months in advance! I am grateful to Andrew Pursey at Borderbus for alerting me to the news that he picked up today the first of two ex Arriva London Gemini bodied Volvo B7tl's VLW113 LJ03MJU It is intended the Gemini will operate the same diagram as the Metrodecker will be next week (0915 from Southwold etc). However due to vinyls needing applying and pre-service checks the Gemini is unlikely to be out in service until June 13th. My thanks to Andrew for the news, and the pic which remains his copyright. You may also notice there is a new addition to the links in the side bar. I met Steven Carty on Railcam, and it soon transpired that Steven, like myself has been suffering from acute depression. However, unlike me, Steven has not been suffering in silence and has blogged about his fight with this very difficult illness. He is a rail enthusiast par excellence, not to mention a really nice bloke. If you know anyone struggling with depression, or have suffered yourself I implore you to read Steven's blog. It gives a rare and valuable insight into how depression can affect thoughts and decisions, and I can only commend Steven for his honesty and openness. Not sure I could do the same. Thanks, Steven for letting me publicise your blog, and I'm proud to know you buddy. They say all good things come to those who wait. On this occasion it's true. 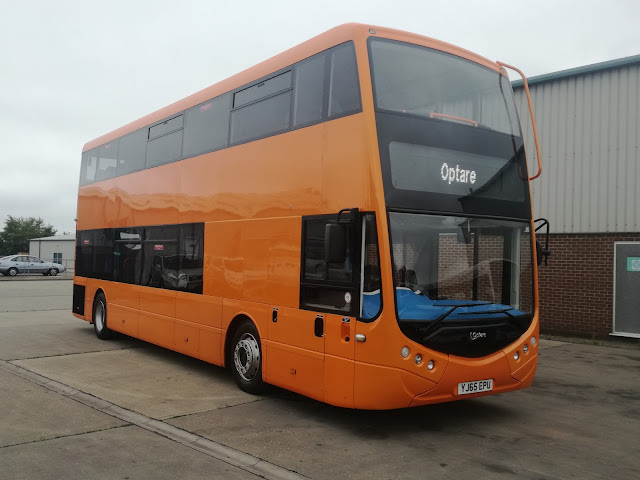 I was all set yesterday to venture over to Beccles to welcome the Optare Metrodecker demonstrator to Borderbus when I received an email informing me it had been put back 24 hours. Clearly Optare had heard the news from Anglian and didn't want to get in the way on that post! 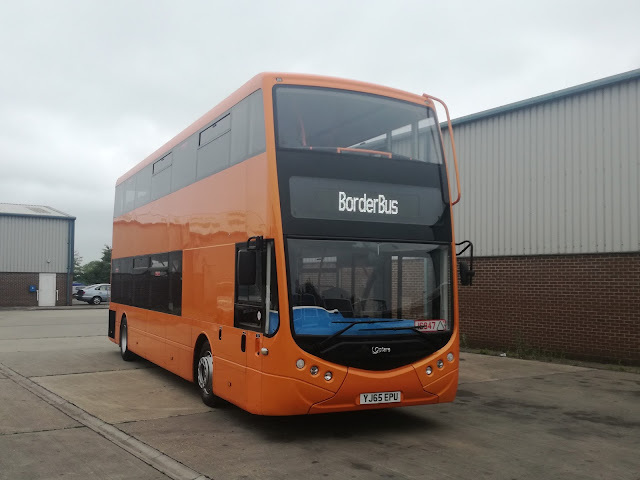 So today I walked up from where the soon to be slashed Beccles Town Service 82 had dropped me, and on entering Borderbus's yard a bright orange thing appeared. No not the much absent sun, but a rather impressive looking bus. I say demonstrator but that technically wrong, as it's more of a prototype. Only 4 are in existence and as yet a production model is to be built. Three of the prototypes are being lent to operators for appraisal and feedback. One of those is in London for whom another is currently in build. I was privileged to be invited on the test drive this afternoon so I can give my own feedback. Regular readers will know I've been pretty scathing about the most recent new vehicles, but once again I boarded with a sense of optimism that this time I would be pleasantly surprised, despite the Metrocity single decker not impressing many last year. The first impression when you board the Metrodecker is there is a lot of blue plastic around. An awful lot of blue plastic. The rear seating downstairs looked rather uninviting, but at the same time there was a feeling of airiness and space. Those seats are deceptively comfortable, and the engine noise unobtrusive compared to other double deckers. There are 32 seats downstairs, which is extremely favourable these days. The upper deck has been very well designed, with a curved front that is almost Borismaster like, and a large rear window giving extra light. There are 51 seats upstairs but nowhere is legroom cramped, and I found it an extremely pleasant environment. I should also add there are no huge pillars at the front obstructing views like the Streetdecks do. The Metrodecker also has something none of us had seen before - the emergency exit is on the nearside of the bus, not the usual offside. How this would impact on a double door version I have no idea, but I assume it could be easily relocated to the other side. And so off we went, and immediately there was a feeling of solidity. The acceleration isn't obvious but it is smooth and consistent. A smooth gearbox ensures no-one will get thrown up the bus. The brakes are just as brakes should be - no screaming retarders, no jerkiness, just smooth effective braking. Upstairs it is extremely quiet, and a ride the quality of which I haven't had on a bus for a very long time. The top speed was impressive, showing that the Metrodecker could handle longer routes such as the X1 with ease. You will also have noticed that I haven't mentioned rattles. No need to -there weren't any. So let's do the scoring as I did for the BYD Electric Bus the other week. Interior Design & Comfort: 10 - a lot of thought has gone into it, and even hard looking seatts are good. Brakes: 9 - didn't notice them which says it all. Build Quality: 8 - too much plastic but no rattles! Feel Good Factor: 9 - couldn't stop grinning, loved it..
That gives an average of 9, which I feel could be hard to beat. I'd recommend a ride on this lovely bus while it's here, and it is without doubt the best bus Optare has ever produced. I have informed by Borderbus that the Metrodecker may be out Saturday but that is to be confirmed. However from Monday it is expected to be on the following journeys, although these are subject to change. Keep an eye on Borderbus's Twitter account. At other times it will be on school work. Borderbus ae also experimenting with a new electronic display for their fleet of Presidents. The first one has been fitted to 206 X652LLX and looks pretty good. There is still no date for the delivery of the two Geminis, and as soon as I hear something I'll post it. As usual my thanks to Dave, Colin and Eric at Borderbus for inviting and letting me have a preview of the Metrodecker. The blog is back. I can't guarantee how regular posts will be as due to circumstances beyond my control I'm not getting out as much right now. That should all change mid July, so please bear with me between now and then. In the meantime thanks to all those who got in touch while the blog was down - your concern means a great deal. I have today received quite extraordinary news regarding the restructuring of services operated by Anglian and Konect effective July 25th. I will go through the changes as sinply as possible, but to be honest it's not all that simple! Services 1/11/12 These routes will now operate on a commercial basis. The Swaffham - Kings Lynn section of the route will be withdrawn. Service 12 will have a revised timetable but the same number of journeys. Connections at Watton with the 3 from Norwich will be improved. Service 61: There are major route changes to the 61. After leaving JPH heading to Yarmouth the 61 will serve Magdalen Estate, Gorleston High Street, Market Gates and continue to Barrack Estate. The section of the route between Kessingland and Southwold is WITHDRAWN due to "the level of competition reducing the viability of this route". School buses 90. BH272 and 5 (Framingham Earl) will also be withdrawn. Wow! This is serious stuff. The main headline has got to be the withdrawal of the Southwold - Kessingland section of the 61 - a huge victory for Borderbus. However it will also mean no Sunday service to Southwold so expect First to make a move - maybe even extending the X1 to Southwold to maintain the popular cross Lowestoft link. I emphasise that is just my speculation and no decisions have been made. The P&R extension is rather pleasing personally - I told Go-Ahead management last year that the only way to compete with the X1 was to put deckers on, and match comfort and WiFi. Job done there but how successful it will be remains to be seen. I like the Caister extension too, but why not all day, giving Caister a direct link with Norwich? Also how will ticketing work? Will Postwick be the only place Concessionary Passes are not accepted? The details when published will be interesting. Rural routes hit again, with Watton - Kings Lynn the most significant cut. I guess that's par for the course these days. Surprised about the 83 on a Saturday. That won't encourage independence for the next generation either.